If the last few weeks have taught us anything it is that international breaks ruin everything. There is nothing wrong with international football per se but the last thing anyone needs, just as club football has gotten underway and seriously interesting to boot, is for everyone’s players to go their separate ways and fly halfway across the world to phone in half-arsed performances in World Cup qualifiers against bank managers and firemen who are only there for a laugh. This is, of course, an exaggeration but the point stands. It feels like half of all players return to their clubs totally unprepared for nonsensically scheduled league matches and either get injured during said games or simply run out of steam after seventy minutes. The September international break has ruined so many seasons now that managers routinely omit players that return with even the slightest knock, or those that have spent more time travelling than training – like Paulinho and Erik Lamela – and it is for that reason that Tottenham’s match against Norwich City on Saturday will probably be very bloody irritating. Well, that is one of the reasons. The other reason is that Norwich are playing – and may well win. Spurs legend Chris Hughton has won many plaudits for the results he has achieved both at Carrow Road and during his earlier tenure at Newcastle United, but the point still stands that he has done so with football so “pragmatic” that pretentious pseudo-aesthetes such as this writer suffer cerebral haemorrhages when they have to watch it for more than five minutes. If you thought watching England under Roy Hodgson was dispiriting, try watching Norwich under Chris Hughton. Two banks of four, hit the big man early, win the second ball: it is almost as though a particularly hateful corporation has staged a covert and hostile takeover of the Canaries and demanded that the club be turned into an obscenely dedicated and lifelike ‘Tactics by Graham Taylor’ tribute act. Last season, only Stoke City and Queens Park Rangers scored fewer goals than Norwich. Only eight Norwich players averaged more than one shot per game and six of them have since left the club. There were many reasons to be encouraged by their work in the transfer market this summer – the signings of Leroy Fer and Ricky van Wolfswinkel, chief among them – but things appear to have changed little. While their attacking stats have admittedly improved (slightly), the opening three games of the season have seen Norwich: outplayed by an Everton side using a nineteen year-old as their midfield fulcrum; somehow defeated by Hull City despite having a man advantage for over an hour; and scraping past a clearly superior Southampton side through a rare piece of technical quality from this season’s Marc Albrighton/Matt Jarvis/insert-one-dimensional-English-winger-here, Nathan Redmond. Despite all the anti-Hughton ranting above it would be unfair to suggest that Norwich are entirely impotent and their resolutely defensive Plan A is one that has been known to frustrate Spurs more often than not. Similarly limited sides like Stoke City, Wolverhampton Wanderers and Fulham, to name a few, have in recent years rocked up to White Hart Lane intent on taking a point and somehow left with three. Norwich’s lineup more or less picks itself. The recently returned John Ruddy is not the most rounded of goalkeepers but as a shot-stopper he is very good indeed. The defence, made up of Steven Whittaker, Michael Turner, Sébastien Bassong and Javier Garrido, will sit on the edge of the penalty area with all the rigidity of a table football defence and ensure that saving shots is all Ruddy has to do. Ten yards in front of them, Robert Snodgrass, Leroy Fer, Bradley Johnson and Nathan Redmond will form a second bank of four and attempt to frustrate a Tottenham side that has shown little to no creative edge in their own Premier League outings this season. Recent loan arrival Johan Elmander will partner Ricky van Wolfswinkel up front and both will do the disproportionately heralded job of running the channels, chasing punts forward and backing into and/or elbowing defenders in order to knock the ball down for onrushing colleagues on the halfway line. Gary Hooper has returned to training following a shin injury and will probably make an appearance from the bench. 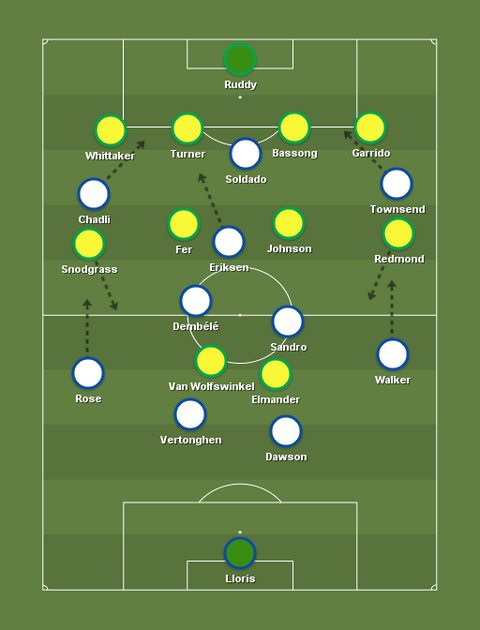 On the rare occasions that Hughton’s men emerge from the trenches and mount a ground-based offensive, Snodgrass and Redmond will provide the cut-and-thrust, driving at the continually suspect Kyle Walker and Danny Rose respectively and aiming to cross to the front two or to win set pieces in the channels, from where Snodgrass has a reliably excellent delivery. If the ball comes back into the centre, Johnson and Fer will not hesitate to welly shots goalward from distance. Hughton is a man who preaches the importance of positive outcomes, particularly away from home, and he will not want his players dwelling on the ball against a reputable opponent when chances to work the goalkeeper are presented. Tottenham’s aim must be to move the ball over distance with short passes at such a pace that means Norwich’s two banks of four do not have time to bed in and become impenetrable. An early goal would be just the tonic and, provided the service from likely starters Christian Eriksen, Andros Townsend and Nacer Chadli is up to scratch, Roberto Soldado will fancy his chances of scoring one. 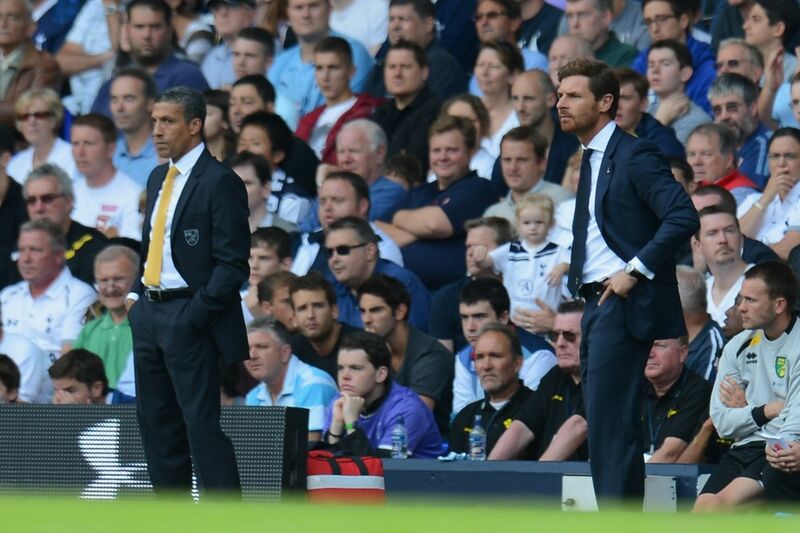 With that in mind, André Villas-Boas’ recent proclamation that the 4-3-3 seen against Arsenal is now Spurs’ Plan A is a bit worrying. Of course, the difference between Tottenham’s 4-3-3 and their 4-2-3-1 has occasionally been barely perceptible but this is a game in which they need to play someone in the number ten role, if only to create uncertainty in the hole between Norwich’s defence and midfield. Gylfi Sigurðsson has not been a smash hit at White Hart Lane but this is the sort of game where he can make a decisive difference. While at Swansea and used in his correct role in central attacking midfield, Sigurðsson scored for fun against teams that employed similarly unambitious setups to the one we are likely to see on Saturday. If the scores are level after an hour, AVB could do a lot worse than introduce the Icelander in place of Sandro and tell him to shoot on sight. With the match likely to be another settled by a single goal, something as simple as that could prove the difference.